Scout Master Steven Nolen is shown addressing the Fayette County Board of Education at its Aug. 31 meeting. 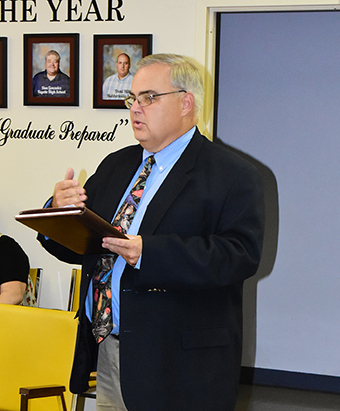 Fayette County Superintendent of Education Jim Burkhalter told board members during the Aug. 21 meeting that the Fayette County school system is exploring the possibility of participating in the Alabama Sentry Program. The sentry program will allow an authorized and certified school administrator in a school without a resource officer to have a firearm on campus in a secure location to protect students and teachers in the event of a security threat to the school. The program would be on a voluntary basis by the school administrator, and the program would work in conjunction with the local sheriff to receive training and certification.